Academic year at ECLA is coming to an end. As final paper deadlines were fast approaching, so was the closing event of David Levine’s Studio Theatre class. Students, faculty and external guests gathered to see five different plays that the participants of the course had worked on during the past few weeks. The concept behind this—very successful—first try of a studio theatre class at ECLA was a very intriguing one. Different tasks had been distributed to each of the students, and as a result there were five directors working on their own plays with seven different actors, many of which rotated and played major roles in several shows in a row. Because most of the plays took place in rather small rooms, it was suggested that the audience split up and always watch the first of two options, and then see the other one in a second round of rotations. After David had held a small introductory speech, the adventure began, and the overwhelming amount of creativity in the plays once more reminded of how fantastic the people at such a little university really are. Starting off with Chatlin’s play, entitled The Attic, the audience found themselves in a white tent, while Maria and Lilit as Bertha Mason and Grace Poole circled it, reading from Jane Eyre’s fictional diary. Not being able to see what was happening “on the stage”, and only occasionally hearing someone breathe against the walls, was a very exciting experience in itself, which culminated when the two characters joined the audience in the tent towards the end, referring to them as “the people in their attic” and involving us in the play by making us read out of the diary to them. 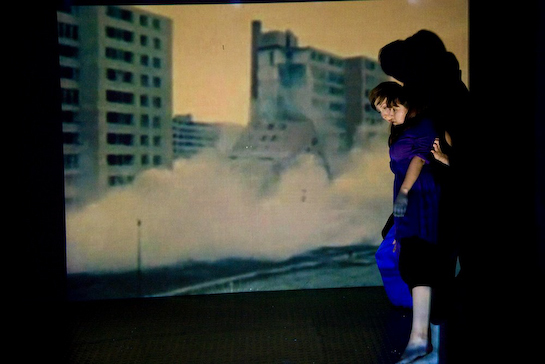 Ali’s presentation, entitled Jacob’s Dream, not only involved acting from Mea and Lilit, but developed into a furious choreography that had been worked out by Vera and Maria, and featured video elements in the background. As it was the first time ECLA offered this class, some influences from first term’s installation class showed through in the students’ approach to theatre. Vira, who also organised the whole evening, confronted the audience with the question of How to Act, by locking us in a room with surveillance cameras, a sound system, and a seductive Google search bar projected to the wall. I believe we all are very curious as to what footage she collected that night. Next on was Catalin’s 4:48 Psychosis, where video installations and live acting worked together to form an outstandingly emotional portrayal of humans, with Vera and Mea as the main actors. Jelena’s play was the one to finish with. Not only did it feature three ECLA students, but Bardhi, Asya and Maria also really managed to capture the audience with their fantastically realistic acting. I would like to use this opportunity to congratulate all the Studio Theatre participants on what great work they achieved, no matter what task they took on for these plays. It is exactly nights like this that remind me of how much I am going to miss this little, precious place in Berlin.